Singapore and Rio de Janeiro are the world's only two cities to contain primary rainforest within their boundaries. Bukit Timah is located seven miles (12km) from Singapore's centre and provides a wonderful opportunity to experience the region's tropical rainforest without travelling into rural areas. It is a 164-hectare (405-acre) reserve preserving a variety of tree and animal species including flying lemurs, long-tailed macaque monkeys and anteaters. Designated walking and cycle trails undulate through the dense jungle and its highest point is marked by Bukit Timah at 538ft (164m). Visitors should resist the natural urge to just automatically take the main route to the summit, as the side routes and detours often traverse the best scenery. The trails are very well-maintained and visitors can choose to go for a gentle stroll or a high intensity hike depending on fitness levels. 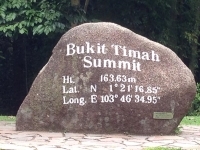 Those hoping to climb Bukit Timah should note that the ascent is steep with many steps. It is best to start exploring early in the morning to avoid the midday heat, but the forest is usually pleasantly cool compared to the city. Park authorities warn travellers not to explore the park when it is stormy as falling trees and branches can be very dangerous.